Mormon Mommy Writers and Friends: T is for Thank You! 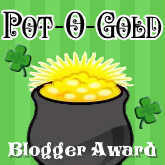 I was pleasantly surprised last week to see in the comments on my post that Christie Wright Wild awarded Mormon Mommy Writers the Pot of Gold Award on her blog, Write Wild. Click on the link above to check out her blog and see the nice things she had to say about us here at MMW! 1. Maggie Fechner, of Mommy's Always Write- I found Maggie's blog thanks to a Saturdays Stories post we did about her last year. She is a Mormon, a mommy, and a published author (not a mere writer!) and her posts are always honest and seem to hit home with me. Her beautiful spirit shines through in her writing, and it's always a pleasure to see what's going on in her head each week! Great job, Maggie! 2. Shawni Pothier of 71 Toes- I discovered this amazing woman and her blog after attending Time Out for Women back in October. Shawni is the 2011-2012 Young Mother of the Year, and I'm pretty sure that she deserves that title and more! Her blog details life with her 5 children, and she keeps it real and fun! Shawni always has some great advice and wonderful motivation- if nothing else than to tell us that even the mother of the year isn't perfect! She's also a professional photographer, so her photos are just gorgeous. Thanks, Shawni! 3. Angie Lofthouse of Notes From the Writing Chair- I'm a new follower to Angie's blog, but I've found myself getting excited whenever I see a new post from her pop up on my blog feed, if nothing else than I get to go look at that amazing photo she has at the top of her page- if that's the view from her writing chair, then where can I get a chair like that?? :-) I found Angie through the LDS Writers Blogfest earlier this month. She is also a published author and offers some great motivation on her blog. Way to go, Angie! 4. Melanie Jacobson of Write Stuff - Melanie is another blogger I found through Mormon Mommy Writers, and someone else I really look forward to reading. Melanie's blog (whose tagline is "Very writey, not at all stuffy. "- LOVE that!!) is lighthearted, fun, witty, and smart. She always makes me laugh and think at the same time, which is a great talent to have. I love her style! Keep it up, Melanie!! Great job, ladies! Thank you for inspiring me to be a better writer and blogger. Blogging awards is a really great way to show your appreciation and love for other bloggers. Thanks for sharing your list. That is so cool that we won an award! And great job passing it on to some wonderful bloggers!